I love the sound of Portuguese. We’ve been in Lisbon since Monday and the city is beautiful. On Tuesday, we explored the Belém district which has two fantastic World Heritage Sites—the Belém Tower and the Jerónimos Monastery. Parts of the city remind me of San Francisco. The red 25 de Abril Bridge spanning the Tagus river (which looks like the Golden Gate Bridge and was made by the company that built the San Francisco-Oakland Bay Bridge); the sea salt-rimed air; the steep hills leading toward the water; the pastel stone buildings lining the streets, their blue and pink colors visible through the fog. The days are warm, the nights cool. 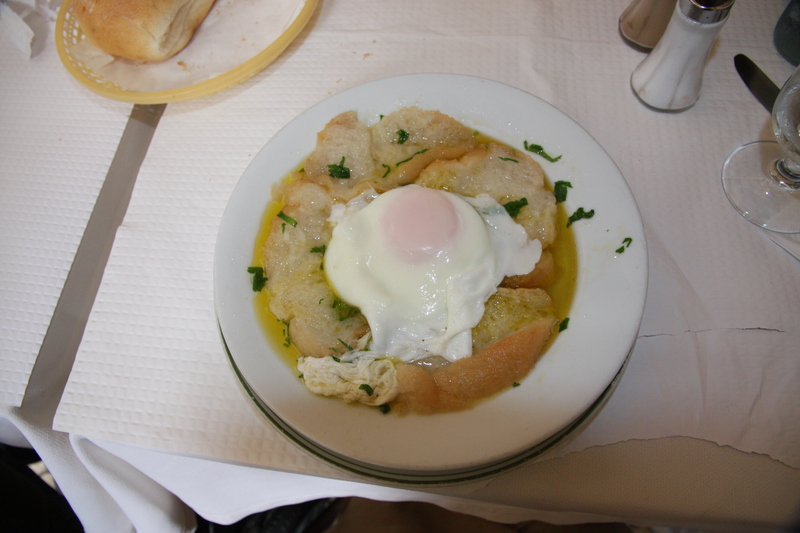 We’ve eaten some delicious fish—dourada, sardinhas assadas, espadarte, robalo—sampled the vinho verde white and red wine, and had one of my favorite dishes: a garlic soup from the Alentejo region flavored with Portuguese bread, parsley and a fried egg. We’re renting an apartment for the week, and despite the steep hill and two flights of narrow stairs (no treat to lug up a heavy stroller), it’s in a great location. I have to say, though, the streets are worse than Italy. Our neighborhood really doesn’t have sidewalks and the pavement is very rocky, making it difficult to navigate the stroller. I should have brought my Baby Bjorn! But it has been fun to explore the local cafés and restaurants. For breakfast, we’ve stopped at a café called Chave d’Ouro (The Golden Key). 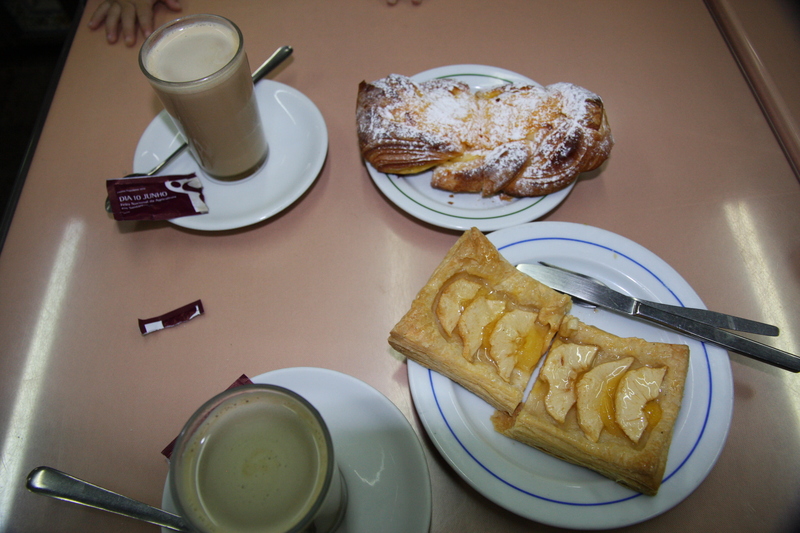 I recommend a coconut cream-filled pastry with a large order of strong café com leite (coffee with milk). Superb. I still prefer cappuccinos, but the coffee here is also delicious. Michael’s conference on pilgrimage and tourism at the University of Lisbon started today and runs through Sunday. On Saturday, we hope to visit Fátima and maybe check out a Fado performance. Até a próxima vez! This entry was posted in cappuccinos, coffee, Italy, pilgrimage, tourism, travel and tagged Belem, cafe com leite, cappuccinos, coffee, Fado, Fatima, fish, Lisbon, pilgrimage, Portugal, Portuguese, San Francisco, tourism, World Heritage Site. Bookmark the permalink.